I've recently learned something new about this country in Pacific Ocean: it's the only country that extends into both North and South hemispheres and into both Western and Eastern hemispheres — its antipode is no land. This curious fact inspired me to design a hypothetical flag for Kiribati, just for fun. 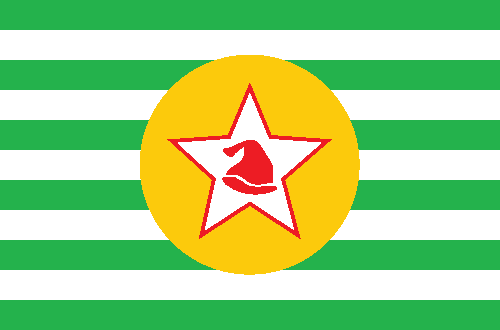 It's a simple banner of the colonial arms of then-British colony Gilbert and Ellice Islands, that also comprised current Tuvalu. The division in four quarters is now obvious. 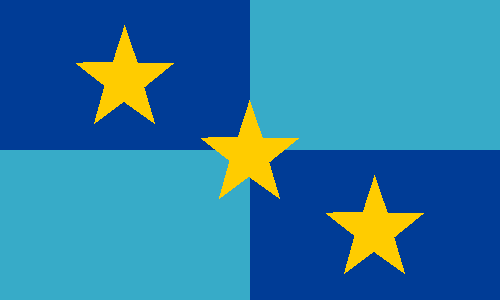 The three stars represent the three main island chains of the country, from left: Gilbert Islands, Phoenix Islands, and Line Islands. Kiribati also contain an isolated island, Banaba, but I don't know the best way of include it. Which proposal do you prefer? So sorry for long absence. I was having problems uploading images on Blogger. 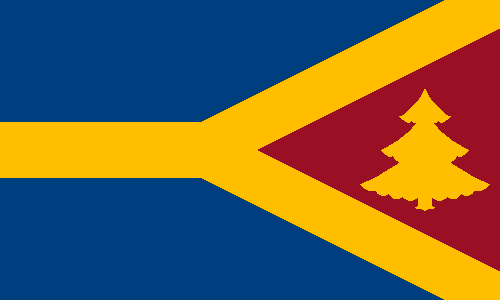 In previous post, I suggested a new flag for Russian oblast of Bryansk. As I said then, I had other ideas, but hadn't my editor available... Now I have! 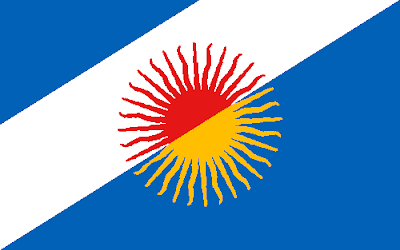 As you can see, it has many elements in common with both current flag and previous proposal, but I think this one is much better thought. The yellow pall divides the flag in three parts. 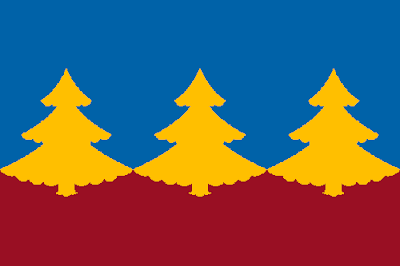 Top blue, bottom blue and burgundy parts represent, respectively, Belarus, Ukraine and Bryansk, like a moderately accurate representation of their geographical locations. Blue color represents Slavic union. 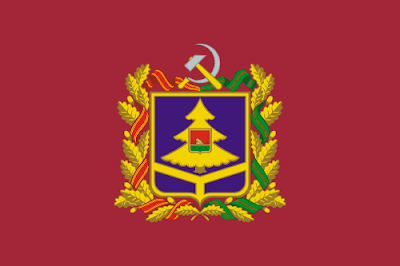 Bryansk territory is represented by the burgundy color, from the troops that liberated the oblast during WW2, and the golden spruce, representing local flora. I guess this flag captures well Bryansk's location and landscape. Comments and suggests are much welcome. 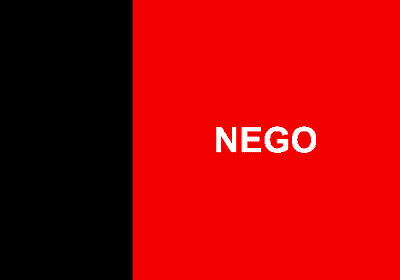 I am curious: which one do you prefer, first or second proposal? 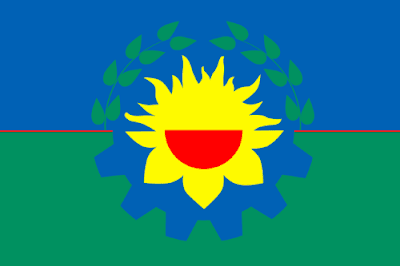 Bryansk is a Russian oblast bordering Ukraine and Belarus. The burgundy background represents the color of the banners Red Army and guerrilla fighters carried during Bryansk liberation during WW2. 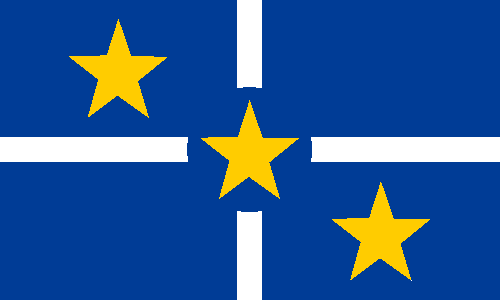 The shield is divided in three parts, representing the triple border, while blue represents Slavic unity. 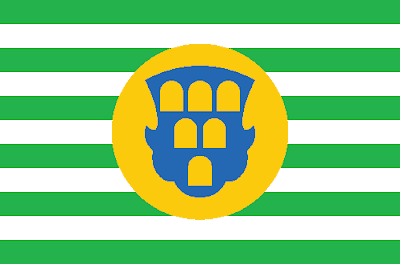 The shield contains a smaller shield, of Bryansk city, capital of the oblast. 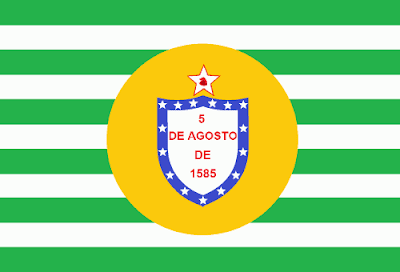 The flag is more paisagistic. The three spruces represent Russia, Ukraine and Belarus. It's just a thought. There are many other ways of recombining the elements, and I'd show some if I had my editor available. 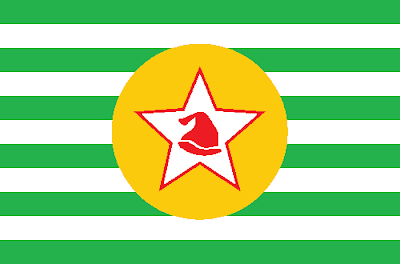 More ideas for Bryansk oblast flag? Show me on comments, please. 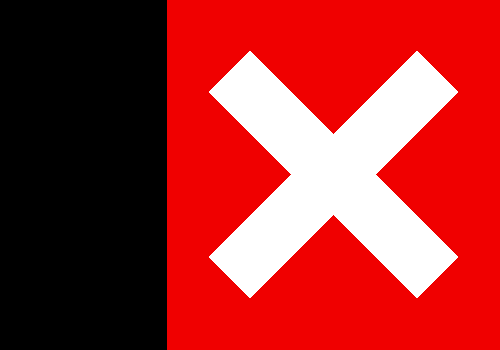 I think the basic pattern is very interesting, specially for a 1920s flag. 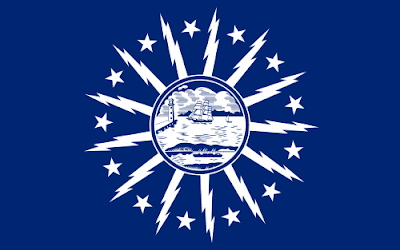 The bolts represent the city as "City of Light", due to its early widespread adoption of electric lighting. 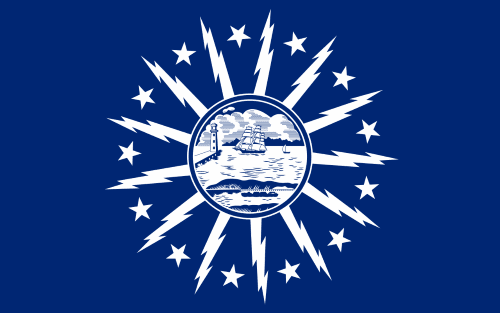 The seal shows city's harbor — very generic, actually. 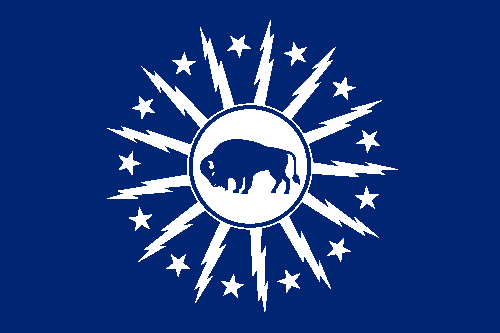 I considered using a brown buffalo, but decided for adopting strictly the original flag scheme. I think the result is amazing, and a much better contender among American best city flags. I'm very sorry by absence last week. 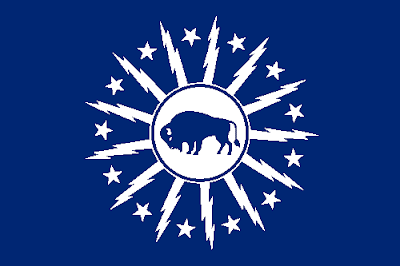 The buffalo design is based on "Buffalo Embassy Project", by Mike Wozniak. By the way, do Buffalo buffalo Buffalo buffalo buffalo buffalo Buffalo buffalo? Bangkok is the capital and most populous city of Thailand. The flag shows city's seal, consisting of Hindu god Indra riding Erawan (or Airavata), his three-headed white elephant, above the clouds. The seal itself is based in a drawing by Siamese prince Naris (1863-1947). The seal itself looks good. However, something as complicate as that has no place in a flag. 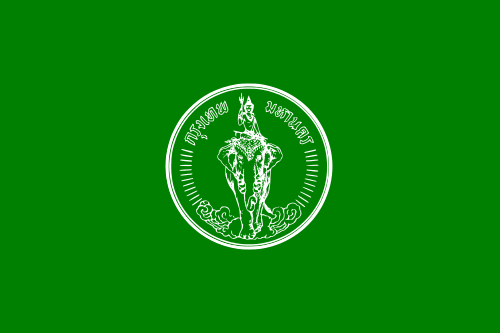 Indra himself is usually depicted in very complex ways, so I decided just for Erawan, on a green background. 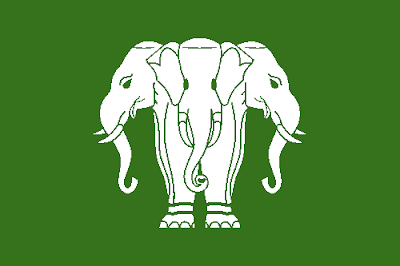 Erawan is more often associated with Laos, but it's also very significant on Thai monarchy symbolism, being even present in royal coat of arms from 1873 to 1910. I'm not sure if it's too synthetic, but I think it's very elegant. Comments and suggestions are always very welcome. I'm not expert in Hindu mythology. If I made some mistake, please correct me in comments area.